In a corporate spectrum, where most of the professionals are lacking moral values, injecting a sense of spirituality works wonder on the behavior and the overall performance of the workforce. Hence, carrying along the ideal "Sarve Bhavantu Sukhinah" of the parent organization, Shri Gajanan Maharaj Sansthan, The Department of Business Administration and Research (DBA & R) was established in 1994 as the first Post-Graduate of department of Shri Sant Gajanan Maharaj College of Engineering (SSGCE). "The world which is torn by turbulence and strife, the thoughts, words and deeds must be in harmony for showing care to the earth that is sustaining us. We attempt to put values in our students which will help them to turn into decisive leaders," says Dr. S. B. Somani, Principal, DBA & R. Welcoming 60 students annually, the department offers a two-years MBA course with the approval of AICTE, New Delhi. The department significantly, received three times accreditations from NBA, two times from NAAC and an ISO certification. DBA & R follows a transparent project, experiential and need-based skill learning which is mostly demanded by the top recruiters around the country. Initiated with the establishment of SSGCE in a rented building, the institution has built its own environmental friendly campus in about 82 acres incorporating cutting-edge facilities and infrastructure. The institute also has a skill development center in its premises, to conduct soft skills training programme, induction programme and counseling sessions for breaking the humdrum of the classroom learning and letting students gaining a holistic development. The teaching-learning process adopted by the faculty members who are experts in their fields, involves case studies, research involvement, focus on e-learning, arranging mock aptitude tests and so on. "We support our students throughout their session and motivate them to resume national and international industrial projects along with vocational industrial training which incredibly enhances their practical skills in accordance with the theoretical knowledge," opines Dr. Somani. The institution follows a transparent project, experiential and need-based skill learning which is mostly demanded by the top recruiters around the country. Supporting the needy students, the management of the institution also included Merit and GATE Scholarships, Financial assistance for project and research work, Sponsored funds, free Hostel and Mess facilities to needy students, Awards to GATE Scorers and Best Projects. Innovation demands research and research provide in-depth understanding and entrepreneurship ideas. Being known as the most prestigious B-school in Shegaon, a town and a municipal council in Buldana, Maharashtra, the institution has accorded the right symmetry of research, innovation and entrepreneurship activities which is embedded in its course curriculum without forgetting the industrial training of the students. The campus moreover owns the "Shri Gajanan Invention and Advanced Research Centre" to foster innovation and research-minded bends in the students. With close collaboration with the Maharashtra Centre for Entrepreneurship Development (M.C.E.D. ), State Bank of India and Department of Science and Technology, New Delhi, DBA&R is executing a number of entrepreneurship development and research exercises within the campus. "Our parent organization, Shri Gajanan Maharaj Sansthan grants us an annual budget of Rs. 50 Lakhs for carrying out the research activities, patent filing and business incubation," shares Dr. Somani. The students, who are enthusiast to start their venture, are provided financial support by the institution to set up and run their idea on pilot basis followed by taking it out the campus later for its commercialization. The rapid evolution of the business environment and the vast transformations throughout the academic realm prompted the requirement of strong relation between the academia and industry. It's a mutual approach where the company offers business insights and the students contribute proven methodology and exercise. Accordingly, DBA & R has conserved this trend and associated with organizations like Associations of Indian Management Schools (AIMS), Confederation of Indian Industries (CII), Incubator Association (ISBA), Govt. of India , just to name a few. The college has also signed MoUs with MITSOM, Pune, MSME (Micro, Small & Medium Enterprises), Govt. of India, Maharashtra Chamber of Commerce Industry and Agriculture (MACCIA), Mumbai and became member of the Confederation of Indian Industry (CII) and The Indian STEP (Science and Technology Entrepreneurship Parks) and Business Incubator Association (ISBA), Govt. of India. The positive impacts of these collaborations are well witnessed by the placement rates of the students yearly, where they are placed in top companies like Axis Bank, Cognizant Technology Solutions, Unilever (HUL), Wipro InfoTech and the list hardly gets an end. "We are blessed to retain a reputation in the industry which acts constructively both for the students and the institution. The long-term goal of the DBA & R is to maintain its heritage and produce more competent and committed managerial human resource with a spiritual foundation to serve the society," concludes Dr. Somani. 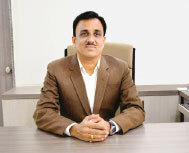 Dr. Somani is presently the Principal of Shri Sant Gajanan Maharaj College of Engineering, DBA&R. He has published 8 international and 2 national journals till date. With an extensive 28 years of experience in teaching he was awarded the Excellence in Teaching in 2012 and Best service award in 2012.